Hundreds of D.C. homeowners have put solar on their homes. But what about those who live in apartment buildings or whose roofs can’t support solar panels? Community solar makes it possible for everyone to go solar. D.C.’s community solar policies allow for a wide range of project models. Where can community solar projects be located? 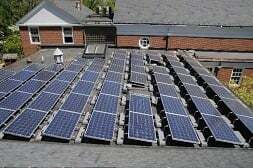 A community solar project can be located on the rooftop of a building (e.g., church, apartment, or warehouse) or on a piece of land in the District. There are no restrictions on the types of buildings that can host community solar projects. But, they must be physically located in the grid supplying the city. This means D.C. and a few edges around the city in Maryland. A company builds a community solar project and sells or leases subscriptions to community members. An organization (e.g., church, nonprofit, business, etc.) installs solar on their building and shares the production with neighbors or community organizations. A condo installs a large system and divides the production among some or all of the units. A group of neighbors gets together and develops a project on a local building or parking lot. A house with a basement rental unit installs solar on their roof and shares it with the tenant. There are many permutations of community solar projects. No doubt more will be developed as the market grows. D.C.’s community solar program does not limit the quantity or variety of community solar projects. The video below describes a recent community solar project in which the Washington, D.C. office of the global law firm Nixon Peabody installed a solar system on its roof which benefits the residents of an affordable housing complex elsewhere in the District. How is electricity from community solar credited on my bill? A subscriber organization decides to build a community solar project (also known as a community renewable energy facility, or CREF). The organization identifies individual subscribers that want to subscribe to the project. The subscriber organization then sends Pepco a CREF project application and provides Pepco with a list of the individuals that will be subscribing to the project, and the percentage of the system’s production that each individual will receive. Pepco receives and processes the CREF project application and the subscriber information. Once the CREF is constructed and complete, the subscriber organization receives final interconnection approval from Pepco. At the end of each month, Pepco calculates how much energy the CREF has produced and divides that production among the individual subscribers, based on the allocation indicated by the subscriber organization. Those credits appear on the subscriber’s electric bill. Community solar projects must be registered with Pepco. If you’re a community solar project developer, visit Pepco’s website to register your solar, file for interconnection, and register subscribers for a project. What is the value of electricity generated from community solar? The credit rate for community solar was established through a long process at the PSC. At first, the PSC did not credit transmission and distribution charges as part of the community solar credits. This meant community solar subscribers would earn significantly less than what they would if they went solar by installing panels on their home. This less than full rate has meant few community solar projects have been built in D.C. even though the legislation to create the community solar program was passed unanimously by the D.C. Council in 2013. 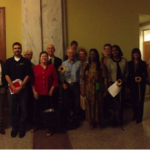 We successfully led D.C. solar supporters in the fight to bring the rate for community solar in line with the rate solar homeowners receive. In 2016, the D.C. Council passed legislation to ameliorate this problem and the full credit rate was restored by D.C. PSC rule-making in January 2017. The current credit rate equals the full Standard Offer Service (SOS) rate for General Service Low Voltage Non-Demand Customer class or its successor, as determined by the PSC. Pepco maintains detailed information on the program. Project developers are in the process of putting together community solar projects. As we hear about them we’ll let you know about options to subscribe and project economics. You’ll be the first to know about new projects available. Click the button below to sign up for future project notifications. 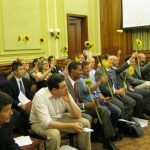 Legislative information about Community Renewables Energy Act – The D.C. Council’s page detailing the legislative history of the bill. 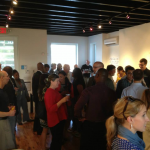 History of community solar in D.C. It took many years for D.C.’s solar activists to get a fair community solar program built in the District. Summer 2011 to October 2013: We worked with a broad coalition of community groups to pass legislation to make community solar possible. 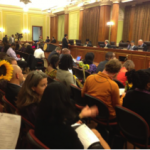 October 1, 2013: The D.C. Council passed the Community Renewables Energy Amendment Act of 2013. The passage of this legislation began a process at the D.C. Public Service Commission (PSC), to finalize the rules for the District’s community solar program. The law gives all utility ratepayers access to on–bill community solar credits for any community solar system they subscribed to or owned. The electricity produced by a subscriber’s portion of the solar installation is credited to their monthly electric bill. The passage of this legislation began a process at the PSC, to finalize the rules for the District’s community solar program. September 2014 to April 2015: The PSC conducts a proceeding to formalize the rules for community solar (see filings above). April 2015: The PSC issued its final ruling for the Community Renewables Energy Act of 2013. Unfortunately, the commission ruled District residents who use community net metering to gain access to solar would not be refunded for the full value of their solar production. Instead, they would only receive a portion of the full net metering credit for solar. They would receive the full rate minus taxes, fees, distribution and transmission rates. This created a “second tier” of solar subscribers – those who own homes and can put solar on their roof versus everyone else who rents, lives in high-rise buildings, or has a shaded roof. CREA was passed in order to serve the latter, but the PSC’s proposed rule undercut its original purpose by reducing the solar credit earned by the people who needed it the most. June 2016: The FY 2017 Budget Support Act amends the Community Renewable Energy Credit Rate Clarification Amendment Act of 2016 (CREA) to restore the full retail distribution rate credit for power sent back into the grid from CREFs (Community Renewable Energy Facilities). The tweak to the statute restores full 1:1 credit to residential customer subscribers. January 2017: The Public Service Commission issues rules for community solar that include a full credit rate for community solar projects. This will enable community solar projects to be built in the District. Mark, Nicole, and Nathaniel Kresowik – Washington, D.C.